They were freed from Arab slave traders between November 1st and 4th of 1868. 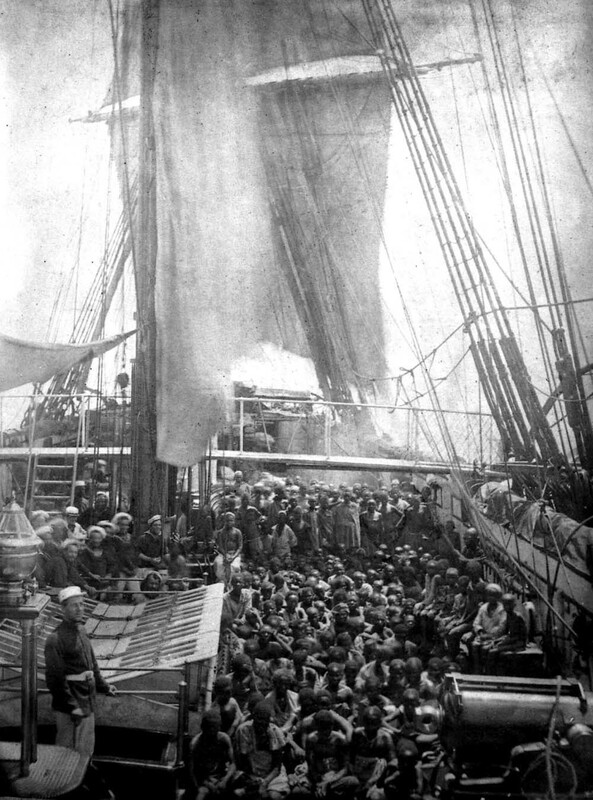 Rescued East African slaves taken from a dhow aboard HMS Daphne, a British naval ship used to prevent the transportation of enslaved people. They were freed from Arab slave traders between November 1st and 4th of 1868. The HMS Daphne was sailing along the coast of Zanzibar to enforce a treaty with the Sultan of Zanzibar that said he was supposed to control the slave traders. Instead he was profiting from it. The Slavery Abolition Act of 1833 ended slavery in the British Empire and the Royal Navy started anti-slavery operations some years before,mainly targeting Portuguese and Spanish ships. The campaign in Britain to abolish slavery began in the 1760s, supported by both black and white abolitionists. The battle was long and hard-fought, with pro-slavery campaigners arguing that the slave trade was important for the British economy and claiming that enslaved Africans were happy and well-treated. However the frequent rebellions by enslaved Africans and evidence of the appalling conditions endured by them during and after transportation led to growing support for the demands to abolish the slave trade. Eventually, in 1807, Parliament passed an Act for the Abolition of the Slave Trade, which abolished the trade by Britain in enslaved peoples between Africa, the West Indies and America. The pro-slavery campaigners had argued that with no new enslaved Africans being traded slave-owners would treat their existing slaves better. However, it was clear that enslaved people were still harshly treated and many continued to resist and rebel against their enslavement. In 1833 Parliament passed a further act to abolish slavery in the British West Indies, Canada and the Cape of Good Hope (southern Africa), meaning that it was now illegal to buy or own a person. However, slavery continued in other areas of the British Empire including the territories run by the East India Company, Ceylon (modern day Sri Lanka) and St Helena. Between 1808 and 1869 the Royal Navy’s West Africa Squadron seized over 1,600 slave ships and freed about 150,000 Africans but, despite this, it is estimated that a further 1 million people were enslaved and transported throughout the 19th century.